On An Overgrown Path: How important is a composer’s music? How important is a composer’s music? Why a String Quartet? What is it that has given it its exalted reputation and mystique? Why have so many composers regarded it as the perfect medium of expression, though it is perhaps the most demanding to write for? And why do distinguished artists often prefer to work as a team in a first class quartet rather than make bigger money as, say, orchestral leaders? Music means different things to different people: but for those to who music is an intellectual art, a balanced and reasoned statement of ideas, an impassioned argument, an intense but disciplined expression of emotion – the string quartet is perhaps the most satisfying medium of all. These words are by Elizabeth Maconchy (photo below) who was born one hundred years ago, on March 19th 1907. She has been described as the greatest ever English composer for strings, irrespective of gender. She wrote a remarkable cycle of thirteen string quartets, and three one-act operas. Her music is lean, sinewy and uncompromising, and develops from the central European styles of Berg, Bartok and Janacek. But, despite all these attributes, the neglect of Maconchy’s music is breathtaking. She is ignored by the mainstream. Her music is absent from our concert halls, and in the classical departments of London's two largest record stores her name does not even appear on the CD racks. And she is ignored by the cognoscenti, with neither William Glock nor John Drummond mentioning her in their autobiographies. The neglect of Elizabeth Maconchy does raise the question, how important is a composer’s music? Comparisons with another twentieth century composer, Erich Wolfgang Korngold, are interesting. Korngold was born in the right place, mainland Europe. He had the right teachers including Zemlinsky, and moved in the right circles, including Mahler and Richard Strauss. He was forced to move to the right place, Hollywood, for the right reasons, political persecution. He worked in the right genres, film scores and neo-romantic orchestral music. And Korngold is rightly recognised with browser space in the CD stores, two biographies, and concert and broadcast performances. Elizabeth Maconchy was born ten years after Korngold, in the wrong place. Her birthplace, Broxbourne in Hertfordshire, is one of the few towns in the world that doesn’t even merit a Wikipedia entry. She had the wrong teachers. Ralph Vaughan Williams, who remained a close friend but not a musical influence, is forever branded an English pastoralist, while her teacher in Prague, Karel Jirak (left), remains as neglected as his pupil. She had the wrong life changing event. TB claimed her sister and father, and she contracted and recovered from the illness herself. This experience contributed to the development of her individual musical voice, and her single minded and painstaking focus. She also lived in the wrong place. Essex is a creative no-go area between the musical honey-pots of London and Aldeburgh. She didn’t network with musical movers and shakers, although she was the first woman to sit on the influential BBC music panel, and was also the first woman President of the Society for the Promotion for New Music. She was married to a historian for more than sixty years, and bore two daughters, one of whom, Nicola LeFanu, is a notable composer in her own right. And she wrote for the wrong genre. The string quartet stubbonly refuses to fit into the sound-byte culture of radio stations such as BBC Radio 3, where a single movement is rapidly becoming the largest acceptable single unit of musical currency. Let’s make one thing clear, I am a big fan of the music of Korngold. In the 1970’s I discovered him through the three pioneering LPs of his music. First the RCA Red Seal LP of his film scores, The Sea Wolf conducted by Charles Gerhardt. 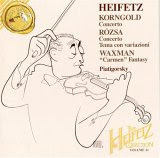 Then, the still unsurpassed, recording of the Symphony in F-sharp with Rudolf Kempe and the Munich Philharmonic (nla), followed by Jascha Heifetz's recording of the Violin Concerto (below). But around the same time I discovered the music of Elizabeth Maconchy. First there was her unrepresentative overture Proud Thames on an adventurous Lyrita LP of 1972 (SRCS 57) that also included music by Geoffrey Bush, William Alwyn and Lennox Berkeley. But the record that got me hooked another Lyrita LP (SRCS 116) with Vernon Handley conducting her Symphony for Double String Orchestra, and Manoug Parikian playing the Serenata Concertante for Violin and Orchestra. It is very sad that the Lyrita re-issues on CD have not included these wonderful recordings in the composer's centenary year. The peak of Elizabeth Maconchy’s achievement are the thirteen quartets, and these span more than fifty years from 1932 to 1984, from the youthful exuberance of the first, to the ultimate concision of the thirteenth (Quartetto Corto) which lasts for just eight minutes. The ghosts of Berg, Bartok, Janacek, and Jirak hover over the opus, and Maconchy's uncompromising approach to composition is expressed in her own notes about the Sixth Quartet: ‘Writing music, like all creative art, is the impassioned pursuit of an idea … The great thing is for the composer to keep his (sic) head and allow nothing to distract him. The temptations to stop by the way and to be side-tracked by felicities of sound and colour are ever present, but in my view everything extraneous to the pursuit of this central idea must be rigorously excluded – scrapped’. We are very fortunate that the neglect of Elizabeth Maconchy’s music is not total. In 1989 Unicorn-Kanchana had the vision to record the complete quartets with three young string groups, the Hanson, Bingham and Mistry Quartets. The performances are committed, energetic, and exemplary. The recordings were produced by Misha Donat, and two church venues were used with the legendary sound engineer Tony Faulkner balancing nine of the quartets, and Anthony Howell the others. These are performances and recordings to die for, and the even better news is that the complete string quartets are now available on 3 CDs on the Regis label for the price of a single CD, and they come with an excellent 24 page booklet of notes by the composer and Nicola Lefanu. But despite this wonderful recorded legacy we are still left with the conundrum of Elizabeth Maconchy - vital and astringent music combined with an unassuming personality. My header photo expresses this conundrum perfectly. When Erich Wolfgang Korngold died in 1957 he was buried in Hollywood Forever Cemetery just a few steps away from another film composer, Walter Jurmann, who is famous for writing the song "San Francisco". When I started writing this article I did not even know where Elizabeth Maconchy was buried. 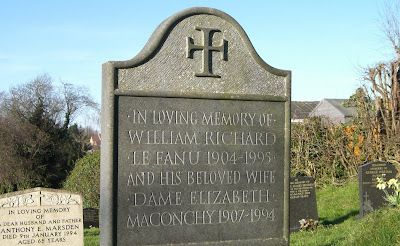 To my astonishment, my research uncovered that the unassuming final resting place she shares with her husband, shown in the photo, is a few miles from where I write these words, at Eaton Parish Church here in Norfolk. But in the end it is the music matters. I started by asking the question ‘How important is a composer’s music?’ The string quartets of Elizabeth Maconchy are important twentieth century music. £15 ($28) is a very small price to pay to find out how important. Good to see the BBC doing their bit. Elizabeth Maconchy (above) is the Radio 3 Composer of the Week starting March 19th, and you can also download audio files of her talking about her art. And read here about another scandalously neglected Elizabeth. What a lovely piece of advocacy. I'll check her out. As far as Maconchy vis a vis Korngold, she was obviously part of the wrong culture for worshipful resurrection. And I like Korngold too. I was dumb-lucky enough to buy the quartets when they came out on Unicorn-Kanchana and have admired them since. I don't know if it was a result of your blog entry but as of 19 March, Broxbourne is in Wikipedia. Thanks for the advocacy. I'm working on some string pieces, and am reconnecting with some repetoire (mostly the Tenney solo pieces, Bartok Quartets), so I decided to order the Quartet recordings. They really are wonderful, thorny yet transparent, dissonant with lots of perfect fifths thrown in, etc. Monday at 8pm (EST), Brave New World will feature three women composers who have, largely, been forgotten: Barbara Pentland (1912-2000), Johanna Beyer (1888-1944) and Elizabeth Maconchy (1907-1994). My show usually focuses on living composers, but there are times when a retrospective is needed. In this case, I was persuaded by two CDs from Jerry Bowles for my “Lost and Found” column on this site. You can hear Brave New World, every Monday at 8pm in Louisville, KY on 90.5 FM, or live on the web at wuol.org.